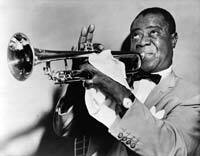 Louis Armstrong was by far one of the greatest jazz trumpeters and singers in American history. Born in New Orleans in 1901 of humble beginnings, the musical work of Armstrong would go on to influence many across scores of different musical genres. Louis Armstrong had a very hard life. The neighborhood he was born in was very poor and tough. His father abandoned his family and his mother turned to prostitution to make money. Louis lived with his grandmother for a while, but would return to his mother’s care. Louis would try to support himself by delivering newspapers and also working in the red light district hauling coal. He would sneak into dance halls, often to scavenge food to sell to restaurants, and, while there, would become exposed to music. While attending the Fisk School for Boys, his interest in music would grow and he would try to formally study it. The economy being what it was led to him dropping out of school at the age of 11. Armstrong, at age 11, began to sing with a quartet of boys on street corners for donations. As time progressed, he would learn to play the trumpet by ear. Details on who helped introduce him to the cornet are somewhat sketchy. More than likely, it was a collective of persons whom he met in music halls as he worked in them and honed his craft. Armstrong did note a man named Joe Oliver was a huge help. By the age of 13, it was clear that Louis Armstrong already was a great cornet player and that he had the potential to become even greater. He was not making a full-time living in music. He played at night and would haul coal during the day. As he grew older, Armstrong would begin playing on riverboats. During this time period, his skill as a musician was improving to amazing levels. He would soon move to Chicago where he would look to expand his career even further where he would work for his old mentor, Oliver, in a band. While he loved playing in the band, he opted to take his career to the next level and move to New York. As a member of the Fletcher Henderson Orchestra, he would switch to playing the trumpet and this would be a very big decision. Louis Armstrong quickly broke out from being someone who was part of a band to someone who could headline on his own. He toured all over the United States and overseas. His schedule during the 1930’s was exhausting, but he was in huge demand and was not going to turn down bookings. In 1937, he became the first African-American to host a national radio broadcast when he was picked as a last minute replacement for Rudy Vallee. Times and tastes would change and rock music would replace blues and big bands on the national stage. Of course, Armstrong was a legend so he was never out of demand for bookings. In 1964, his song “Hello, Dolly” was a massive number one hit. This led to scores of tours and bookings. Perhaps such constant work may have taken a toll in his health. He died of a heart attack in his sleep in 1971.